Most dentist are all too familiar with the Saturday afternoon emergency phone call from a distressed parent or relative when fun and games came to an end with a dental injury. 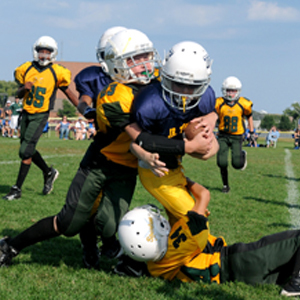 In fact, dental injuries are one of the most commonly incurred injuries on the sporting field. Games like basketball, football, rugby, and even water polo often result in orofacial injuries, leading to tooth displacement for the unfortunate athletes. Immediate management and treatment of these injuries is often the key to restoring the injured tooth back to its original state. These are some of the most common and painful sports injuries that dentists often have to attend to. Tooth fractures refer to the breach on the enamel and possibly dentine, which may or may not result in an exposure of the dental pulp. Where fractures involve the pulp immediate treatment is the best chance to avoid a possible root canal. It is important that athletes consult their local dentist as soon as they can for an emergency evaluation. And fingers crossed simple management with restorative materials and medicaments will save the tooth from needing further treatment. This injury occurs when a blow to the teeth cause a tooth to move sideways in any direction. It may also be associated with a fracture of the surrounding bone. A dentist will take and Xray to determine the extend of the damage before deciding on what treatment protocol to follow. The tooth may be repositioned and splinted allowing the surrounding tissue to heal. Further treatment after stabilisation is very often required, especially in older teeth. Tooth intrusion refers to the displacement of the tooth into the tooth socket. The tooth will appear shorter than usual. In severe cases, the tooth may even appear missing. The degree of intrusion will dictate the treatment indicated. A dentist will take an Xray to determine the best way forward. Repositioning and splinting is usually the first step and further treatment is dictated by the severity of the injury. The tooth becomes partially displaced from the tooth socket. Usually, a long and loose-hanging tooth means that the tooth has extruded. Repositioning the tooth back into the right position should be done as soon as possible and the tooth will have to be splinted to give it some stability while the ligaments and bone around it heals. As with most other dental trauma injuries, further treatment is often necessary and will be assessed by your dentist. The tooth is completely dislocated from the tooth socket. The immediate action would be to recover the tooth. Repositioning the tooth as soon as possible will give it the best prognosis. If a trained medical professional is available repositioning can be done right there and then making sure that the tooth is clean and the right way around. A brief wash with cold water is acceptable but the tooth should not be scrubbed. Otherwise, place the tooth in a proper storage medium such as saliva (in the patient's cheek) or milk and bring it to the dentist along with the patient of course, where the dentist can help the patient replant and splint the tooth. This is the painful dislocation of the jawbone due to trauma, and it can be common in contact sports. Symptoms include the lack of ability to close the mouth, and pain when you return to the proper jaw position. Your dentist will also look for any signs of fracture of the mandible when they take an Xray. Prevention is better than cure . The best way to prevent dental injuries is to wear a mouth guard before participating in any sports even during warm up and practice. Always have your dentist's number ready however, just in case you or someone else might need their help.